Allied Security alarm systems are of the highest specification providing exceptional reliability and outstanding value for money. The most common type we install are Wireless Intrusion Alarms with movement detection sensors protecting all areas of your home from unauthorised entry. 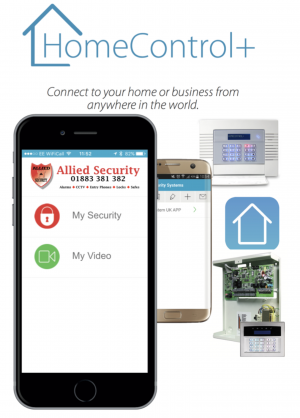 Our Smart Home security system allows customers to be in total control of their home at all times from their SmartPhone, iPad / Tablet devices. Remotely switch your alarm system on and off, view the status of all the alarm sensors to see which areas are occupied, download system information allowing you to check that children are home safely from school. If the alarm system is activated you will receive an immediate alert on all of your Smart devices and you can view the alarm detectors and CCTV camera images to investigate the activation.